A Golden age….but for who ? – Dirty wet dog , boats and sailing. Now, should that be ‘who’ or ‘whom‘ ? my grammatical’s are never the best. In this post i am going to finish my current writing and video project : that of reviewing the boats and books of the late L. Francis Herreshoff. In previous posts i took a look at ‘The Compleat Cruiser‘ and ‘Sensible Cruising Designs‘ . Just as i was finishing the last episode contained within my post ‘The poor man’s yacht’ the third book arrived in the post, this one being ‘The golden age of yachting’. It’s most likely that i won’t get the video finished for this post because , shock-horror, i have actually got my boat alongside and i am actually getting some jobs done. So, in this post i am going to take a look at 2 things : first the new book, as it covers a whole load of material from the big racing cutters of the late Victorian era and onwards, to a whole section about the glory days of the steam yacht…..essentially small private steamships. Second, i am going to try and get a sense of what Herreshoff’s America was actually like, what was going on at that time and so forth. The period that Herreshoff talks about in ‘The compleat cruiser’ and ‘Sensible cruising designs‘ seems to be the 1950’s or at least the immediate post second world war period. I said in my first section of the review that i really couldn’t get a feel for what the USA was like at the time so i had a lot of fun doing some basic research. The best way of putting that across seemed to be via a whole load of images, it being said that a picture is worth a thousand words…..so i have saved a few eh ! Ok so, first i would just like to say a few words about the structure and content of the book. First there is a quick historical tour of the early days of going on the water as a leisure experience as opposed to warfare and trade. The first ‘proper’ yachts as we might know them appearing as small armed sailing ships in the reformation period. After that it’s straight into the big steam yachts and from there a technical discussion about the marine steam engine and then logically into smaller, faster steam launches such as ‘Turbinia’ which i had heard about. After that it’s into the really big sailing, racing and cruising, yachts including the big private cutters and schooners up to and including the inter-war years. After that there are sections about the ‘J’ class and the races for the America’s cup. The racing cutter ‘Reliance‘ in dry dock, one of the most extreme and short lived boats ever built. Lets take a look at the kind of thing, i hesitate to say boat, that Herreshoff is talking about in his section about the great era of steam yachts. The one i found a useful image of online actually made me smile in the same way that my recent boat names thread did : boats such as ‘Chuckle’ (Chuckle made me smile post), recently, ‘Fat bottom Girl’ and most recently the appropriately named ‘Slaphead’. I do love a good boat name, especially the ones that are a bit more personal than the endless ocean this and storm that. The steam yacht below is, as far as i can tell, ‘La Belle Sauvage’ and if you know modern steampunk literature at all you will know that ‘La Belle Sauvage’ also appears in a book except that it’s in Philip Pullman’s recent book from the dust series and it’s a canoe. It is owned by the hero of the story , a young boy and it’s owners friend keeps over-painting the name to call it ‘La Belle Sausage‘. I read Pullman’s book while i was recuperating from my knee surgery and it made a nice relief from far too much Solzhenitsin, Dostoyevsky and Nietzsche…..far too heavy a diet ! La Belle Sausage then in all it’s obnoxious glory. Lets just call it the BS for short. Now i don’t know how many crew it took to run the ship, for small steamship it was, and to look after the maybe half dozen family and guests but a similar ‘yacht’ had 140 crew* according to the book ! As i sit and try to account for that many people i start at one end, so obviously a captain and mate or 2, then a chief engineer and probably a couple of engineers mates, after that i guess a bunch of sweaty stokers and oilers. What else ? a bosun and some deckhands, quite a few stewards to pander to the owner’s every wish, maybe a governess and teacher if the family had children, but 140…..i wouldn’t even be able to remember their names. That one maybe was a bit unusual being a ‘Royal’ yacht so add to the ‘useful’ crew a whole load of ladies-in-waiting and basically flunkies of some kind …..the norm for the ‘great’ steam yachts being a mere 40-50 or so. Just to put that in context, the great clipper ship Cutty Sark, of the same approximate time frame sailed with a crew of between 26 and 30. Cutty Sark carried some 32.000 square feet of sail and she was said to be able to run at an average speed of 17 knots….to put that into context the maxi yachts that i sailed, considered to be the big boats of that era carried around 5,000 square feet of sail and usually had around 17 or so crew. I have laid alongside a couple of big modern superyachts (power) and the biggest of those ‘only’ had 40 crew including one stewardess who just looked after the owner’s wife’s clothes. I have heard it said that the modern superyachts owned by the current super-wealthy run with about the same number of crew, except that quite a few of the newer ones include a heavy contingent of personal security. Herreshoff tells us that this was the glory days of the great steam yacht and genteel living for a few aristocratic families. Somehow i thought these would be the newly wealthy of the USA in it’s prosperous pre-first war era but apparently not. Although there was some new wealth, even super-wealth, most of the big yachts were from Europe and a several of those were British owned. Now, ok so the British Royals had one or 2, and several big racing cutters for sport, Britannia for example, the Kaiser (some German geezer with a dodgy helmet) had one….oh and he had a big schooner as a racing dayboat ! etc etc. Before i get too far into my own opinions about Herreshoff’s ‘golden era’ it would be as well to read some of his words. These short takes are from the sections about the great steam yachts : only one of several sections of the book. “One of the things i remember about the large steam yachts was their characteristic and delightful odor. If you passed under the stern or close to leeward of one of them you smelled the combined odor of new varnish, linseed oil, brass polish , Havana cigars and champagne all mingled with engine room smells and the slight odor of teak and other exotic woods, to say nothing of the burned gases of the naptha launches . To a sailor this combination was delightful. Me again : well i can hardly keep my bile in check. I can only guess that life aboard was something like an upstairs/downstairs division of class. For sure the captain may have been held in some regard as a competent and loyal retainer but from there on down i suspect that it was a stratified society all the way downhill to the lowly stokers who, Herreshoff says, were controlled by the Ch.eng with threats and persuasions ! I guess that a ‘job is a job’ at any time and maybe a job on a steam yacht was a lot better than some. 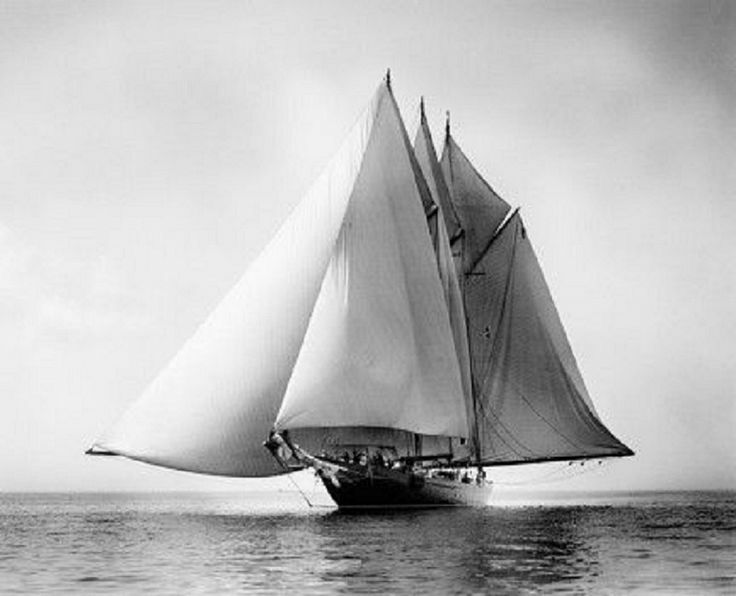 Nor can i see how Herreshoff gets from a descent from ancient earls to ‘good sailors’, i once had the pleasure of knowing an old yacht surveyor who had sailed on the big cutters and the J class yachts. I cant imagine the landed gentry somehow as bowmen or mastmen aloft on a big racing cutter….perhaps ‘good sailor’ simplay meant that they knew which side of the boat to up-chuck on. The old surveyor i knew told me that the skippers and crew of those big boats were made up principally of Essex smacksmen who sailed and fished all winter off the coasts of Europe and then made their real money by crewing the big race boats during the summer. The lives of the smacksmen makes for much more interesting reading to my mind but that doesn’t appear in Herreshoff’s book at all but what does appear is his apparent disdain for professional yacht captains of his own era. I find it very hard to read this kind of thing, although technically interesting, without holding in mind the greater history of the period. That i find is my own take on all of Herreshoff’s books where the boats and sailing seem to be happening in a vacuum with no reference to anything else going on : a couple of major wars for example. If we take just one enormously privileged and powerful royal dynasty’s of the time, the Saxe-Coburgs for example, in one branch we get the British royals, in another the Russian Czar and then of course we have Kaiser Wilhelm…..well between them i think they should have had the power and influence to prevent the catastrophe of 1914-18 and none of them did. I can barely control my contempt for the whole useless lot of them. Dodgy helmet day !……what a total arse . In parallel with reading Herreshoff’s ‘Golden age of Yachting’ i have been trying to create a sense of what Herreshoff’s America was like at the time he wrote ‘The Compleat Cruiser‘. That period seems to be the immediate post second world war period, so the 1950’s and i only have a fragmented idea of what that period was like in any sense. I’ve studied the history of the cold war, so called, from a British perspective because i had an interest and i lived very close to the UK’s own ‘V’ bomber bases. Of course these were the early years of the nuclear era with the USA developing the hydrogen bomb in 1952 and the Soviet Union having a fully functioning weapon by 1955. That was only one small area though so i did searches for everything from returning servicemen and what their lives were like, the politics of the era for example the MCcarthy hearings and the civil rights movement. While reading ‘The Compleat Cruiser’ i wondered what Mr and Mrs Goddard, their daughter ‘Miss Prim’ and her mate Veronica looked like, what their homes were like, what it was like at work and so on. From there i looked at advertising, art and music : did you know for example that doctors were portrayed in cigarette advertising not only smoking but claiming that smoking was healthy and good for you ? Now i just need a good sailing book written in the 1960’s…..that would be fun ! *British Royal yacht ‘Osborne’, according to Herreshoff the usual complement was about 50 crew. Previous A dedicated follower of fashion. How the other half (%) lived eh. Good read and I really enjoyed the slide shows. I just need a good book from the sixties now ! You could make some grand slide shows I bet. How about this one? It’s describes an extended 1960s sailing trip in a self-built small boat by “a retired working stiff” along the US east coast. Not read it myself but sounds good.